Real life "superhero" saved a man's life. Every fictional superhero started somewhere. Be it a tragic family massacre or forced mutation through government experimentation, there is an origin story for every crusader, regardless of their mask-wearing status. These heroes are seen as the merging of good and bad. Vigilantes, doing noble work through (usually) illegal means. These vigilantes don't only live on our screens or in our comics, however. There have been several instances of real life people taking the law into their own hands - one of the most notable being Seattle's Phoenix Jones, who just this week is credited with helping to stop an attempted murder. According to the local police blotter, police responded to reports of an assault at 2am Sunday in Seattle, where they found a bloody man on the ground. Three suspects attempted to flee the scene, but were apprehended by police. The victim was unwilling to provide information regarding the attack, but Jones informed them that he had seen the suspects "pistol-whip and kick" the victim after knocking him to the ground. Jones later recalled the story for KIRO Radio's Jason Rantz, saying that he came upon the incident while patrolling Capitol Hill in plain clothes. After alerting police, Jones says that he ran into the man with the weapon, knocking the gun away. "I sprinted out as fast as I could and hit him with a right hand," he said. "The gun popped out, only the scary part was he didn't get knocked out." The other two men attempted to get the gun and Jones fled for safety. The police arrived shortly after, with Jones saying he managed to corner one of the three suspects until the police arrived. "Thank you @seattlepd but the real story here is how fast and great the officers I worked with this weekend were. as crazy as it sounds once the arrest was made people were recording the cops and harassing them about bother black people. People really need to open there eyes and judge cops on a play by play scenario not based on bias cop media. #truthhurts"
According to the blotter, the victim was taken to the hospital with non-life-threatening injuries. Two of the suspects were booked for assault, with one - a convicted felon - booked for assault and unlawful possession of a firearm. 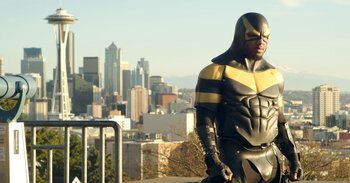 Phoenix Jones has previously stopped a robbery, was arrested following a pepper spray incident, and was involved in a "Mutual Combat" situation.